The Pennsylvania Star Wars Collecting Society is honored to support Operation Troop Appreciation through a special charitable fundraiser. 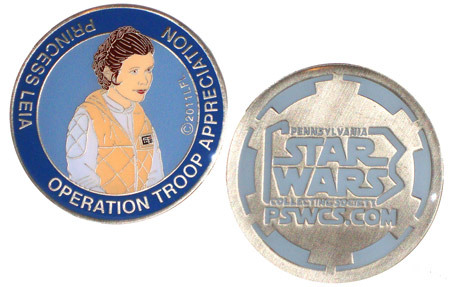 We will be selling medallions featuring Princess Leia in her Hoth battle gear from the original Star Wars Trilogy. The medallions were produced in a one-time run of 1000 medallions with the permission of Lucasfilm Ltd. All proceeds generated through the sale of these medallions will be donated to Operation Troop Appreciation. Ordering instructions can be found below. Kristen Holloway, founder and President of Operation Troop Appreciation, embarked on a personal project in March 2004 to provide Under Armour® t-shirts to a local Pennsylvania National Guard platoon (1/107 FA, Alpha Company 759 MP) of 38 soldiers deployed in Iraq. An overwhelmingly positive response from the soldiers, those who helped with the project and from family and friends proved to be the spark that gave birth to Operation Troop Appreciation. It only took a few months to grow this one simple project into a national organization; and on July 1, 2004, Operation Troop Appreciation was established as a Pennsylvania non-profit corporation, with federal 501(c)(3) tax-exempt status. Since that time, thousands of soldiers have received "wish-list" items from Operation Troop Appreciation. The generosity of private individuals, small business partnerships, and corporate sponsors have enabled Operation Troop Appreciation to present a united front of appreciation to our deployed American heroes. These medallions were inspired by the concept of "challenge coins" which are popular among military personnel. Given Operation Troop Appreciation's efforts for deployed service members, PSWCS felt it to be a distinctly appropriate collectible to offer to support the charity. International Buyers: International buyers must pay via PayPal. Please use the Add to Cart button under the International Orders header below. American Buyers: Please use the Add to Cart button under the Domestic (USA) Orders header below. If you don't have access to PayPal, please E-mail charity@pswcs.com with your mailing address and the number of medallions you would like to order to receive instructions for paying via check or money order.